Parents are always on a search for new and exciting things that will bring joy and entertainment to their children life. Sometimes the seemingly boring activity can keep the child engaged for hours. It's always great to sit back and watch kids having fun, running around, jumping, and playing. Isn't that one of the "beautiful feelings" that parenthood is about? 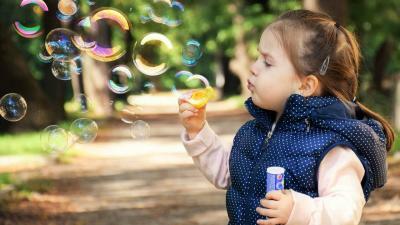 While it is fun to point a laser around the room to play with children, a really fun toy is actually... bubbles!